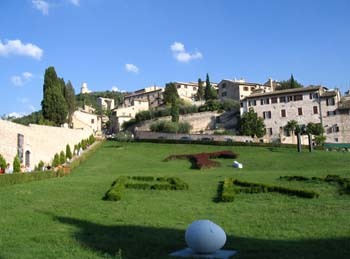 It is late afternoon when I arrive in Assisi; I have no idea what to expect. But as the bus winds its way up the hillside in which the ivory-colored buildings of this medieval town are nestled, I feel something pinch my heart. The feeling takes me unawares. Looking about me, I try to grasp its meaning. It is as if something inside me is being drawn to the place. I get off the bus and look up at the town still above us. The vague emotion increases as the slow but deliberate funicular carries me upward to the entrance of the town. My heart is pounding but I cannot tell if it is from carrying my heavy suitcase or because of this strange feeling. The sun is setting, and with a backdrop of a crimson-smeared sky, I enter the stone gates and step back centuries in time. I have never been to this place and yet somehow it feels familiar. I start down the small cobblestone main street, no longer noticing the bulk of my baggage. All my senses have become heightened, causing me to feel somewhat confused. I look around me at my fellow passengers from the bus and try to ascertain if they are feeling the same way. They are certainly as impressed with the place as I am; I hear their breathy laughs and see their awestruck looks – even a kind of bewilderment. They too have a sense that that we are far from our own realities. I hear someone say, “This is unbelievable.” I find myself giggling at the sudden out-of-time feeling. But that other, more intriguing feeling persists. It is not a déjà vu experience; it is not as if I feel I have been here before. However I feel as if something in this place belongs to me. The view of the surrounding countryside is breathtaking: below are scattered farms and cottages that ramble across lush rolling hills into the distance. The beautiful sunset enhances the dreamy quality of the experience. We are all mesmerized. My fellow travelers stand dumbly in the middle of the street taking pictures or peering down small cobblestone alleyways wondering where they might lead. 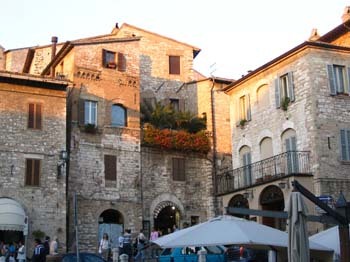 The town is a cohesive and integrated community of ancient white brick and stone buildings. Wrought iron balconies with brightly colored flowers are the only accents. Despite the incongruous ATM in the main square, there is nothing 21st-century about this place. Slowly, I allow my startled senses to bring the town into focus. 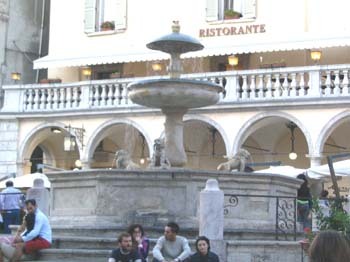 I become aware of a soft romantic fountain making gurgling sounds in the main square. People are gathering around it, laughing and gesturing. I continue to feel a subtle sense of belonging: it is as if I am a weary traveler who is glad to see the sights of home again. I am entranced by the rich history that surrounds me. I watch wistfully as lovers walk hand in hand, and I enjoy watching others savoring their wine and cheese at a sidewalk café. I feel a sense of peaceful invisibility as I continue ambling about the town alone. While I wander up an alleyway, a Franciscan priest makes his way down the road dressed in a simple dark brown robe with the traditional rope tied around his waist. I have to remind myself that I am actually here and not just imagining it. And then, somewhat surreptitiously, the word “sacred” comes to mind as if someone has just spoken it. 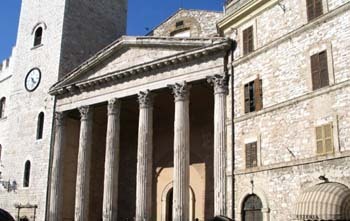 I begin to think about the term and why it has surfaced here in Assisi. I begin to get a sense that this town has a lot to tell me about my personal history. 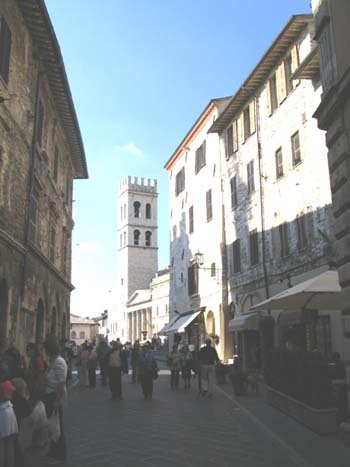 Apart from the city’s rich Roman history, I begin to realize what makes Assisi so recognizable to me. This is where a very familiar story from my childhood actually took place. 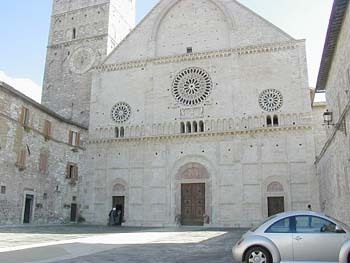 It is the birthplace of Saint Francis, and the Franciscan movement. Saint Francis of Assisi (1182-1226) was the son of a wealthy cloth merchant. No one loved pleasure more than Francis did; he was quick witted, sang merrily, and delighted in fine clothes and showy display. Handsome, gallant, and courteous, he soon became the favorite among the young nobles of Assisi. When he was about 20 years of age, Francis went boldly out with the other townsmen to confront the Perugians in one of the petty skirmishes that occurred so frequently at that time between the rival cities. In the ensuing battle he was captured and held prisoner for more than a year. During his time in captivity he developed a fever that developed into a lengthy illness. As legend has it, the illness appears to have turned his mind to more profound matters; he began to examine the very nature of existence. He also began to ponder on the emptiness of the life he had been leading before his long illness. When he regained his health however, Francis was consumed by a renewed eagerness for glory and he resolved to take up a military career. The internecine rivalries of the towns and City-States of Italy in those days provided plenty of opportunities. He therefore prepared to set forth to Apulia with a knight from Assisi who was about to join Walter of Brienne, of Champagne. The latter had taken up arms against the Holy Roman Emperor, Frederick II over claims of his wife Alberia for the Kingdom of Sicily. Francis saw this as an opportunity for military greatness.The night before he left for Apulia, however, Francis had a dream in which he saw a large hall filled with armor that was marked with crosses. He heard a voice say that the armor was for His soldiers. And then, a second illness further interrupted his plans. 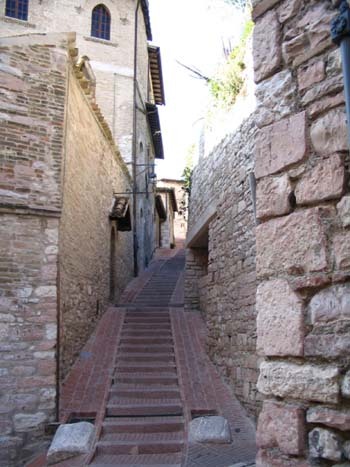 During this second illness he had another dream in which a voice bade him turn back to Assisi. He did so at once, and his military career ended at that point. Although Francis still spent time with his comrades, his demeanor had clearly changed and his life had taken a new direction. The final turning point in his life came when he met a leper on the road. At a time when such people were always avoided, Francis found himself approaching the man and even embracing him. Events then started to escalate and Francis found himself caught in a dilemma of duty between his biological father and his Heavenly one. At one point, Francis was praying before an ancient crucifix in the Saint Damian roadside chapel which was in serious disrepair. There he heard a voice say “Go and rebuild my house, which, as you see, is falling into ruin.” Francis took the command literally and proceeded to sell all his worldly goods, which included some of his father’s gold. He used the money to repair the church. His father was furious, beat him and locked him up until his mother finally released him. Still furious, his father took Francis to court in order to have his inheritance denied. Francis therefore stated that he was in the service of God and no longer under civil jurisdiction. With this, he stripped himself bare in front of his father handing over to his father his clothes and possessions, saying that he only desired to say “Our father who art in heaven.” Dismayed by his son’s sudden and strange behavior, Francis’s father disowned him. On hearing the news of Francis’s dramatic change of ways, his friends ridiculed him. Others in his town also either mocked him or shunned him. Even in those days, and certainly by today’s standards, his behavior was considered bizarre. But Francis remained steadfast. He began to wander the surrounding hills and spent his time working on restoring old churches. Eventually he renounced all possessions and adopted the traditional simple brown robe that signified his now impoverished status. He then began to beseech others to follow his example and live a way of life that included brotherly love, peace, charity, and poverty. Many soon began to follow him, and with his followers Francis traveled from town to town, sharing their message and interacting with people from all walks of life. Despite the negative reactions to his personal transformation, Francis still managed to start an entire movement. He devoted his life to good works and is known especially for his love of animals and nature, and his beliefs in tolerance and peace. He spent the rest of his life in this peaceful little town, where I too was feeling peaceful and happy. In retrospect, I realize that I believe people and events from the past can indeed “speak” to us — through our own minds. In the very special context of Assisi I became aware of the surfacing in me of deeper feelings and thoughts which had always been there but had been lying dormant for some time. As I listen to the tour guide who is conducting our bedraggled yet enthralled group around Assisi, my thoughts drift back to my teenage years, a period of time when I seemed to know all the answers. I was raised a Catholic, went to church most Sundays, attended Sunday school classes with the rest of my peers, and I heard the word “sacred” a lot. We studied the Bible, talked about the lives of great Catholics, took communion, and learned all of the required prayers. I remember thinking I knew all the answers, and that I just knew that life would work if I followed a simple equation: do good deeds and you will live a good life. After graduating from high school, finishing college, and entering my own version of life as an adult, I was left to explore my own ideas of what religion is, and what kind of faith-based “insurance policy” would ensure a good life. Reality struck as I saw the world in new ways. I realized that things don’t always turn out the way we think they should. Church faded away. CCE faded away. All the traditions of my youth faded away. Even the word “sacred” faded away. Somehow I lost what I went to church for — or had I ever really had it? Did I ever feel this genuine connection, or was it the institution of the Church that told me I did? What was the difference between my personal beliefs and the beliefs that were suggested to me in my youth? Realizing that I have digressed in my thoughts, I consciously bring them back to the present as we head back to the hotel. 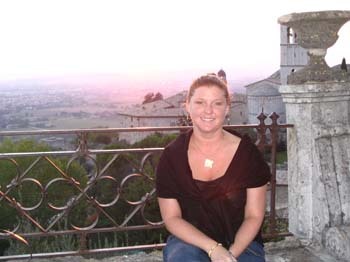 It was also not until I set foot in Assisi that I got a true intuitive sense of what “sacred” means to me. Sometimes when you lose something, you can find it again in the most surprising places. I now realize that a kind of personal renaissance occurred in this calm and quiet little town. My childhood faith had disappeared but it reappeared in this sacred little town; it just had a different face. To me faith is one’s own personal truth; what drives your soul. This is why retaining faith in humanity, as Francis of Assisi demonstrated, is sacred. Through my encounter with Assisi, I began to really understand what is absolute, eternal, indestructible, and purposeful in the sacred. 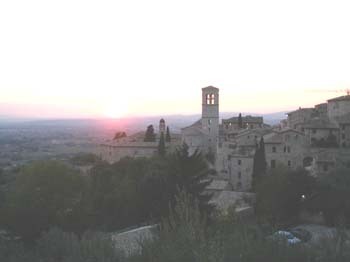 My renewed sense of the sacred is like the town of Assisi seen through the evening haze of sunset and thin clouds. And I now realize that this simple but exquisite town is the embodiment of the saint who lived here, and of his fundamental values. The simple love of nature and animals of Francis of Assisi, the peace with others he ultimately strove to achieve, his love of travel (in his limited region of the Italian peninsula), and his need to connect, are human qualities that I now realize have always been sacred to me. His ability to be fully “present” in life and his decision to live that life to its fullness is what sacred means to me. Saint Francis of Assisi lived a way of life that celebrated the happy circumstances that he created for himself, and looked to the universe for. That is my universal truth: the blessedness of happy circumstances, the ability to see beauty in whatever surroundings you find yourself in. And that was Assisi. 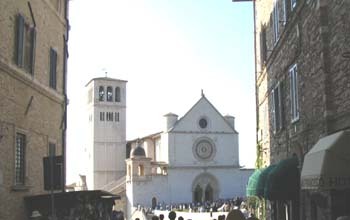 There is a lot more that can be said about the life of Saint Francis and of the town of Assisi. It does not matter if you are particularly religious or not. What matters is the feeling of quiet coherence that you get when you wander through the town’s medieval streets. It is also the pure air, the vibrant flowers growing on the old terraces. In Assisi it is a feeling of personal privacy and yet an awareness that you are a part of something bigger; a part of history, of culture, of continuity. It is a kind of timelessness; that you are walking in the footsteps of a simple man with good intentions. As I sit quietly eating my gelato and watching the sun set, I cannot help but feel I have just had a conversation with Saint Francis.